Divisions & figures printed on aluminum scale mounted inside plastic casing with water bottle & wick. Mercury / Red spirit filled. 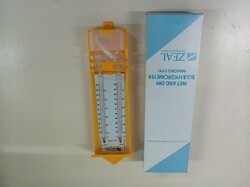 (c) Dry and wet bulb thermometer. We are engaged in manufacturing and exporting a wide range of Wet & Dry Thermometers. These are provided with mercury filled imported glass and white back thermometers, fixed on metal scale. Also, these thermometers are equipped with superior quality reinforced polypropylene plastic case, and a lid &d bulb protector. We are engaged in manufacturing and exporting a wide range of Wet & Dry Thermometers. These are provided with mercury filled imported glass and white back thermometers, fixed on metal scale. We are looking for bulk query only. Comprising two -10 to +50 deg. C thermometers fitted on scale. One thermometer bulb is covered with muslin, which is kept moist by being connected to a reservoir of water. Mounted on a painted, wooden base. With humidity and temperature conversion chart. 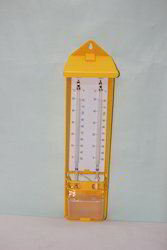 - A selection of traditional Wet and dry bulb Mason’s hygrometers. - Comprising Moulded plastic wall mounted case- two thermometers mounted on a silk screened scale - plastic reservoir and cotton wicks.